Discussion in 'Pins for Sale/Wanted' started by ItzaPinfan, Apr 16, 2019 at 11:28 AM. I’ll be at DLR quickly next Thursday Morning if anyone wants a pick up. Windows of Magic will be trade only, looking for windows of evil. MerlinEmrys and Connies_Hobby like this. Would you please pick me up a crest of the kingdom? Thank you! I'd like the SW countdown AT-AT pin please. I know this is a long shot but depending on how Merlins pick ups go this week, could I ask you to keep an eye out for the Lady and Tramp Vintage Vinyl, incase there is any floating around? I'll update you in a couple days as to if I got one through Merlin or not. 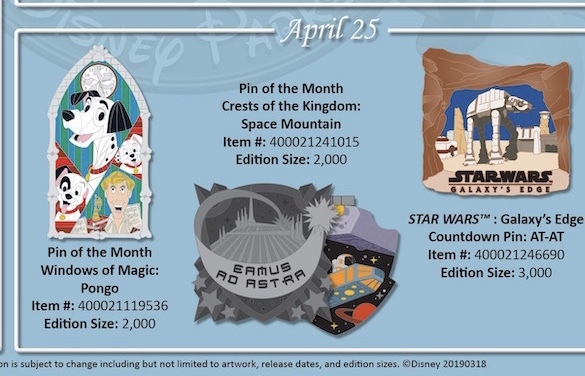 If possible, can I please get 2 of the AT-AT Countdown pins?